Yoga Direct's Striped Foam Yoga Block is a sturdy, scratch-resistant foam yoga block featuring a light blue stripe down the side, which will help to enhance alignment and correct posture. Our striped blocks are a great choice for home practice, when a yoga instructor is unavailable to correct posture. The striped block comes in the standard 4 inch size and although it is soft and comfortable to hold onto, is surprisingly strong and supportive. 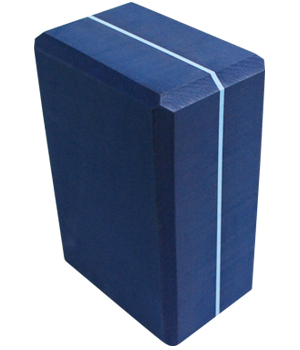 Not only does this block have the added stripe, it is also much denser than our standard foam block! This item is available in blue or purple with the option to customize through custom printing for yoga studios. Each block comes individually wrapped for resale convenience. Our Foam Yoga Blocks are made from a sturdy, scratch-resistant foam and are lightweight and easy to use - a perfect block to provide in any yoga class. This striped yoga block is slightly denser than our standard 4" x 6" x 9" block. These blocks are strong enough to support any Yogi's full weight, and are comfortable enough for use under the head or used as a seat. Foam yoga blocks provide support and stability for proper alignment in class, allowing your clients to practice postures safely and effectively. The 4" x 6" x 9" is the standard size to supply for class, and is available to be custom printed with your company or studio's logo or design. We guarantee these Foam Yoga Blocks will never get mushy, no matter how often they are used! Each Yoga Block comes individually wrapped, and can easily be resold in boutiques and Yoga Gift Shops. The striped block is the only block our members like to use. the stripe makes them a little sturdier. got these on the buy one get one free promotion. Excellent quality, nice and dense and not too heavy. Great for my beginner's practice. We are very happy with these blocks! The quality is great and both our teachers and community are really liking them. I'm new to yoga, so these blocks helps a lot with my yoga routine. I like how sturdy they are. These blocks are of great quality. I use them in my studio. They are not squishy and unstable like lighter, cheaper blocks. These provide the density, firmness and stability I was looking for. If you're not sure which block to choose, you cannot go wrong with these. These blocks are just the firmness I need for supported poses, without being squishy and unstable. They will easily support my 250 lb. body while standing on one foot, and are stable, yet cushioned enough for a supported setu bandha sarvangasana (supported bridge). They are very similar in look and feel to "brand name" blocks that cost a lot more, they just don't have the logo. Figures Fitness Center that I go to uses these blocks. I liked them so much I asked where they got them and the owner told me Yoga Direct. I promptly checked out the site and ordered 2 of them in purple. (The center uses blue.) The blocks are very firm and that's what I need being new to doing yoga. The softer ones just don't work for me. My next purchase will be a zabuton! I love the way they look and they are just the right amount of sturdy and supple. I use them every day!